At Wednesday Night Knitting, we played around with Day 3’s concept, photographing our projects in a totally different light. Ethel’s scarf, staged as blowing in the wind. 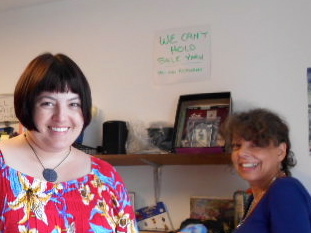 (Actually, Rachel was holding it up with a long crochet needle behind-the-scenes). Meanwhile, Rachel was busy with a seam ripper. All needlework welcome! 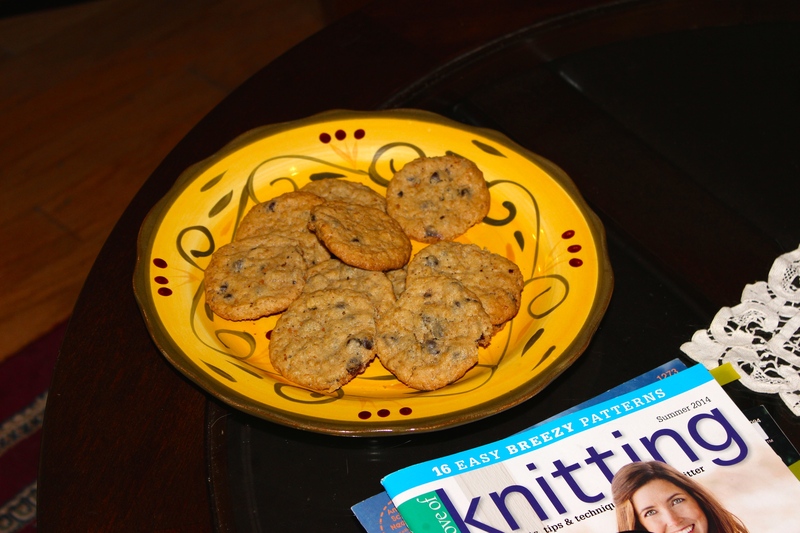 sigh, another week gone by without Knitting Group. Only because I was traveling and enjoying the holidays, and when I got back I was toast. 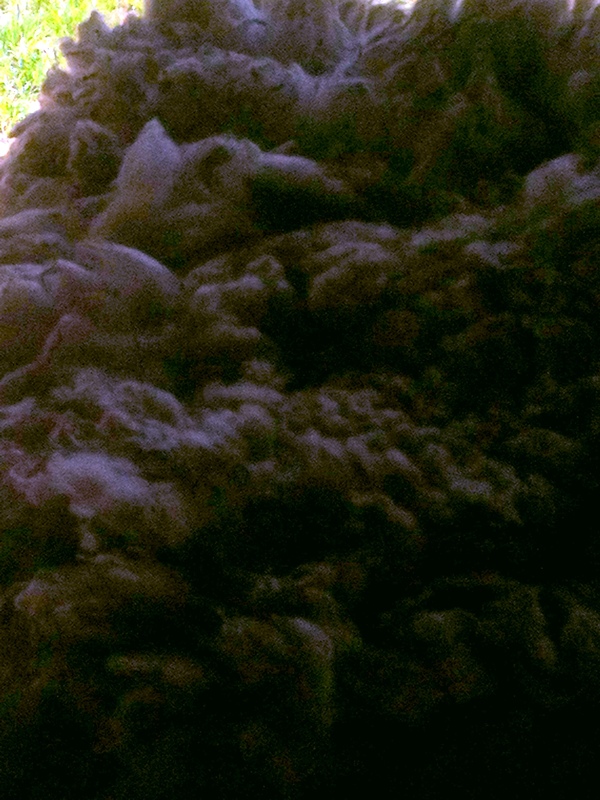 But I haven’t been completely un-knit. No sir, I’ve been a little busy at fiber-analyzing. DH made me a couple of nostepinder for a fun gift. 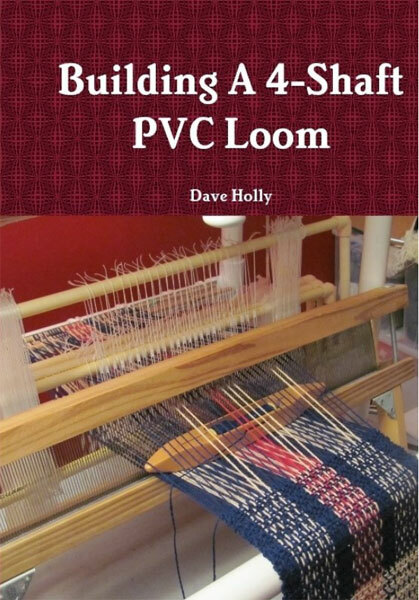 Thank you, Knitting Daily Blog, for the heads up on this nifty tool that a woodworker can turn on a lathe. With this ornate little pin, you can wind unruly yarn into a neat, tidy ball that pulls out from the middle, like the skeins you buy at Joann’s and Michael’s are supposed to do. 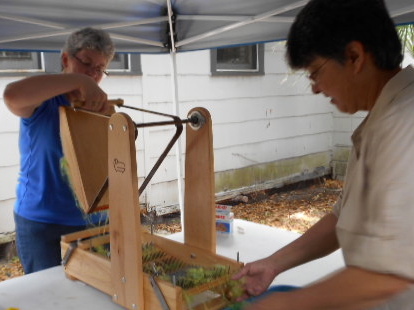 Winding, winding–there’s an art to it! These two are made out of cherry wood, sanded with 600 grit paper, and finished with tung oil; very silky and smooth. 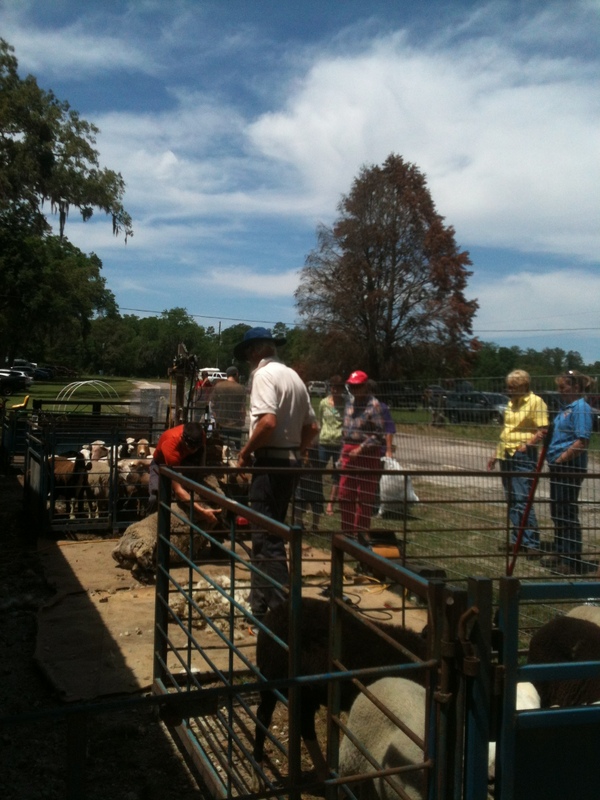 I also wandered around Four Purls in Winter Haven the day after Christmas, right when a bad storm was blowing over. It’s a wonderful shop. 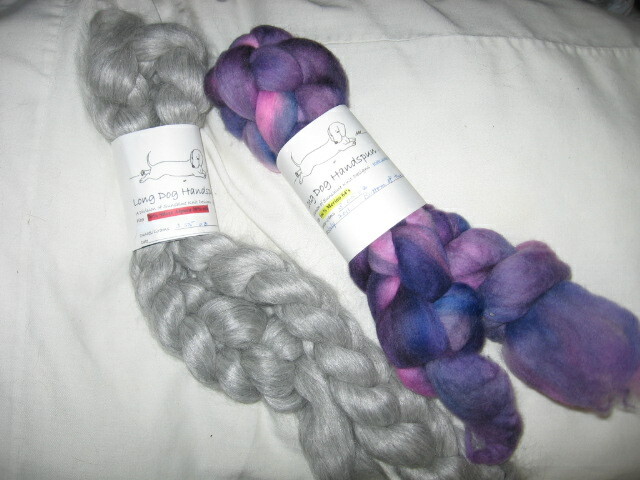 Friendly knitters, hanging around knitting, engaging you in conversation, complimenting you on your choices. 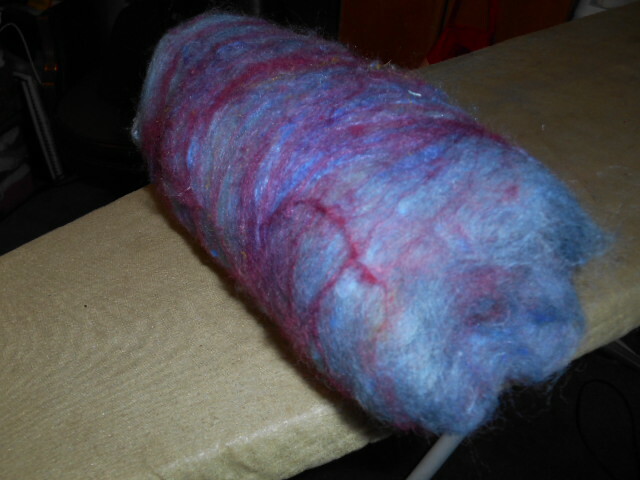 some of the art yarns in there were just unspeakably gorgeous. 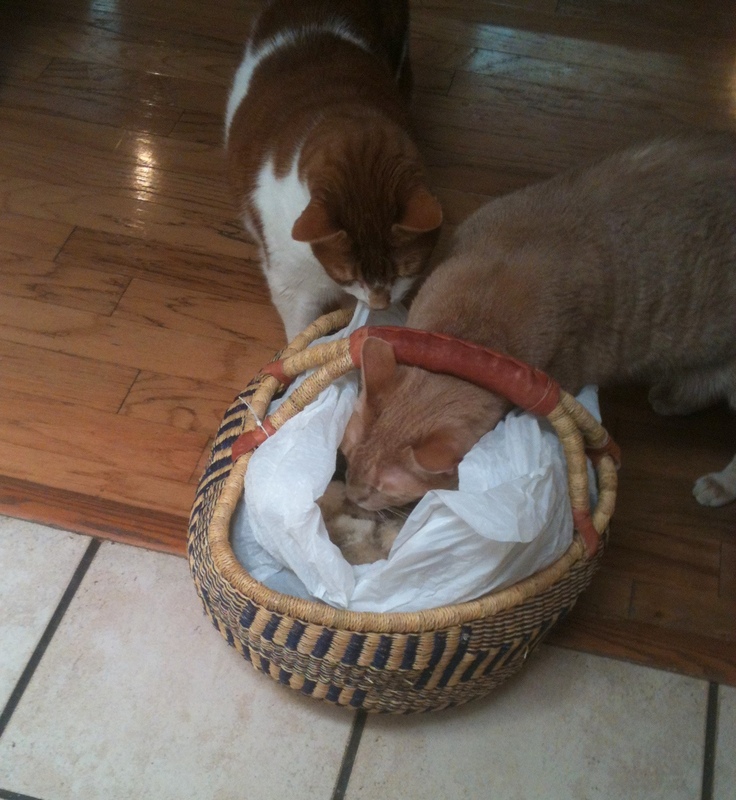 Shuddering, recalling their shiny, glow-y strands! 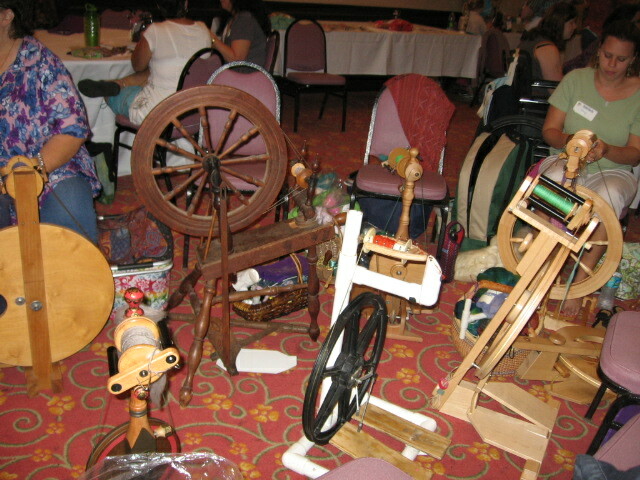 I got some great advice about spinning wheels: quite a few spinners love the Schacht Ladybug. I will keep watching You Tube to see what EVERYONE in the whole world of spinning thinks about this that and th’other wheels. Please feel free to give a comment about your wheel or your hope-to-be wheel. I tried to work on some mosaic knitting from Love of Knitting. 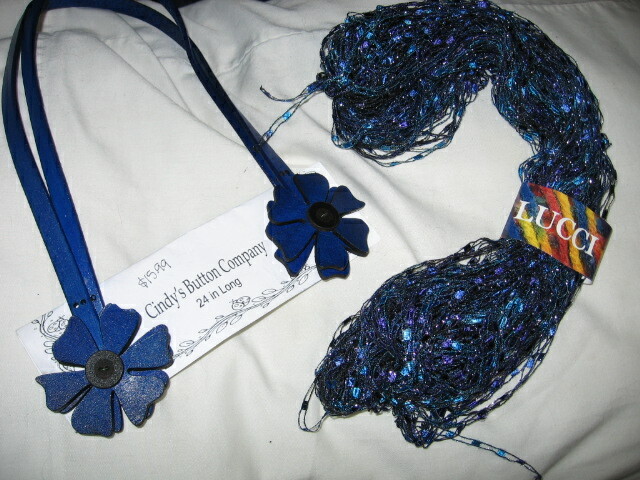 Finally settled down to work on a hat from Sock Yarn Studio, an October giveaway from Peacefully Knitting. I thought at first all the lovely projects were a bit beyond my capabilities, but here I go! 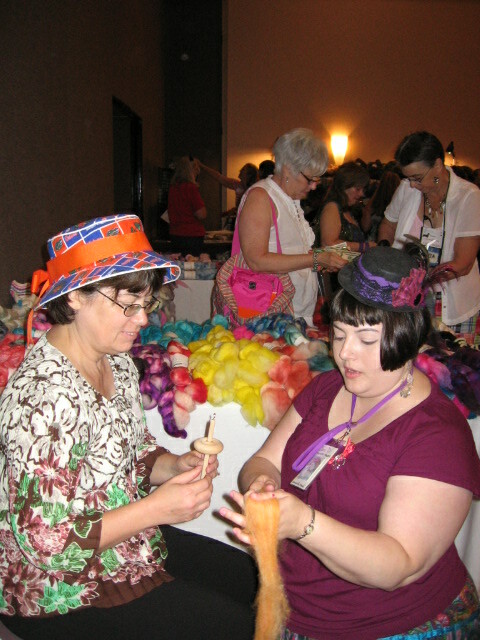 We knitters expanded our minds and boundaries, embarking on a little adventure September 16 & 17. Starting with a Friday drive to Windermere, we made our way to a temple session and met with friends from Gainesville who were in Orlando for other events. We dined at the world-renowned (to our world, anyway) Pollo Tropicale, feasting upon black beans, rice, sweet plantains, fried yuca, with guava barbecue sauce and Caribbean condiments, and guava cheesecake for dessert. Drawn like magnets hurtling along West Colonial to the Ocoee Tuesday Morning store, we managed to squeeze in some major shopping before closing time. Savory yarns, packaged roving, felting supplies and half-price QVC clothing were a few of the spoils we won and stacked up in the luggage slot in back of Tina’s van. 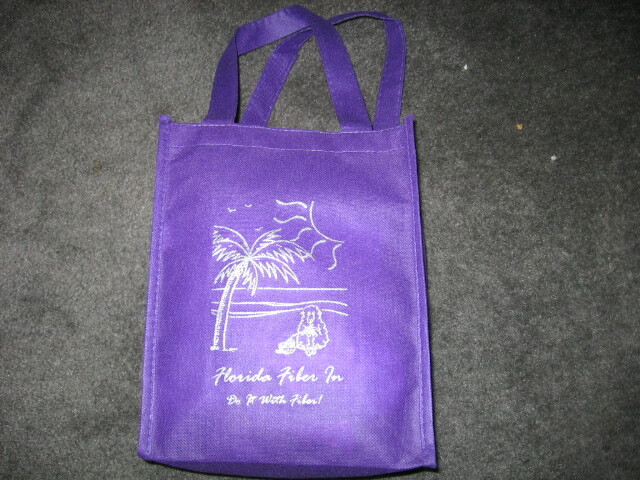 Back at the Radisson hotel on International Drive, some of us settled into our room and the rest ventured on to the opening session of the 2011 Florida Fiber In, which had kicked off a few hours earlier. Dazzled by the array of colorful fibers at the vending booths, spinning apparatus, knitted and crocheted items, and brightly-dressed people with big personalities, we browsed and befriended. Several booths were selling drop spindles–some of these were plastic, some unfinished wood, and the high-end ones in birds-eye maple and other exotic, beautifully grained, polished woods, were priced at $35 a piece. 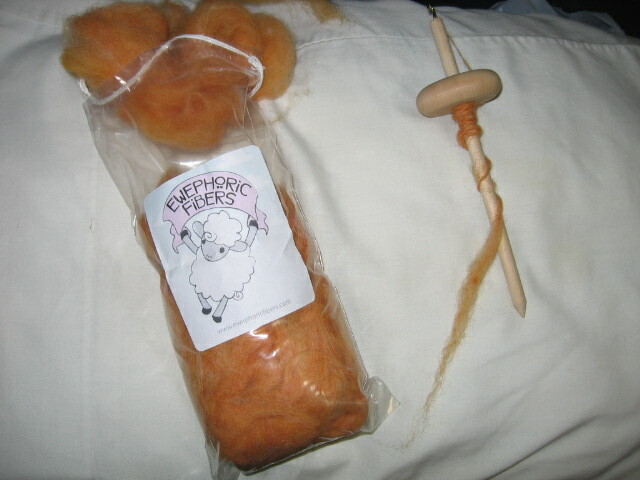 I bought a package from Ewephoric Fibers, a Gainesville vendor, which included an unfinished wooden drop spindle, a generous amount of alpaca/shetland/border leicester roving, and a free lesson, which I opted to fulfill the following day since we were getting tired. Jane Dominguez added a complimentary herbal sachet to my bag, because I had spent over $20. 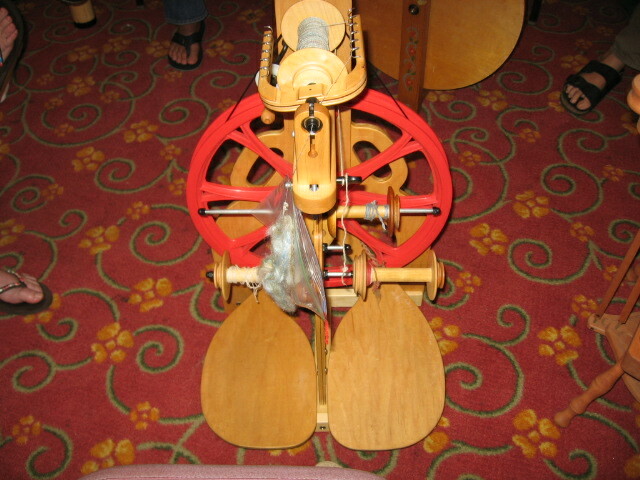 I have a feeling that the introduction of the drop spindle is going to be a life-style changer for me, like the invention of the wheel was to cave women! Next morning, we dug into the conference for real. 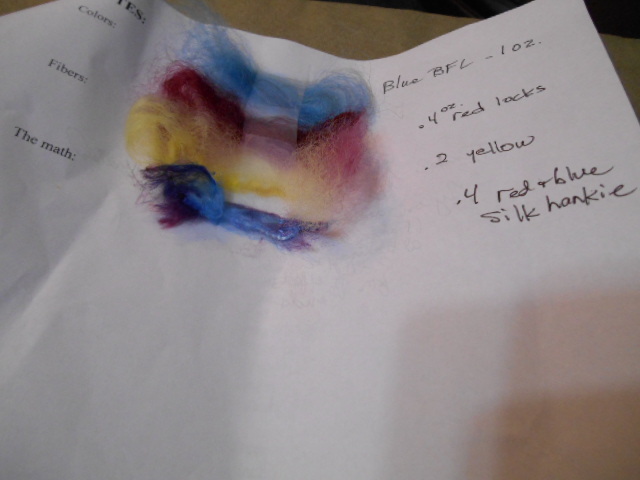 Ethel may have gotten in on the end of the first workshop, which was all about dyeing fiber. 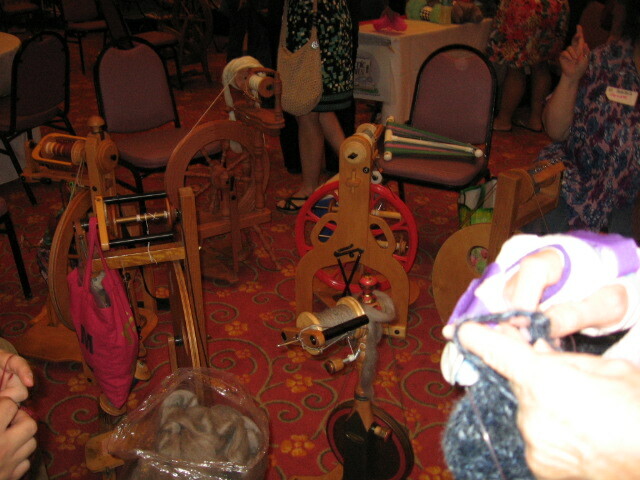 I got a front-row seat in a workshop called “Ply on the Fly” in which the presenter showed how to make yarn from roving, using one of those fascinating drop spindles. 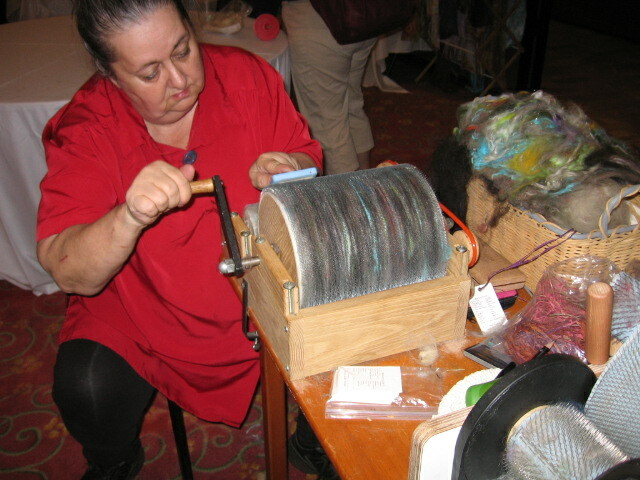 Her preferred method, called Navajo Ply, used the single ply everyone else seemed to know how to do, but added a step where the single strand twisted back on itself and added another ply to the yarn. 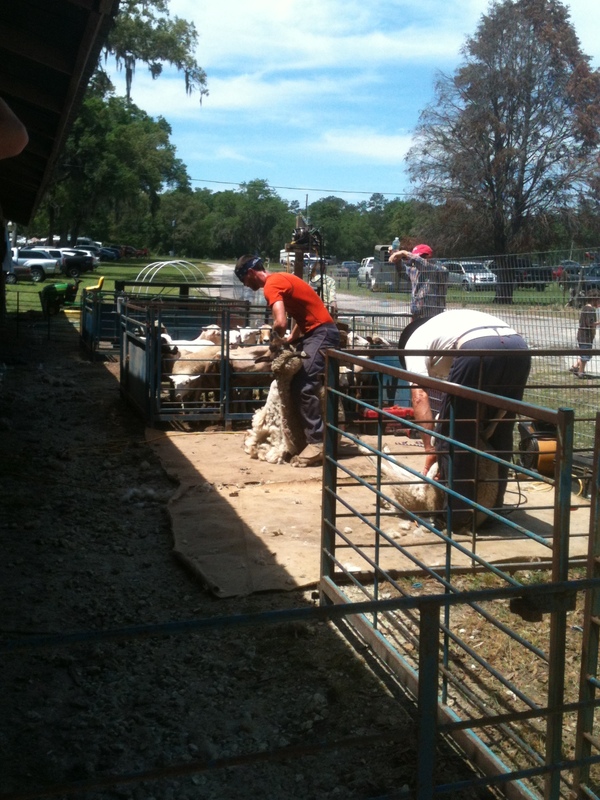 I watched very closely and have misty, unsure memories of the process as yet. She said she drop-spins riding in the car, watching TV, just whenever. She showed us earlier a sweater she designed and made from Cherry Tree Hill sock yarns, the awesome Technicolor Dream Coat. The next workshop was “Toe-up Socks”–but I didn’t nibble since the room was pretty full and the acoustics weren’t that great. 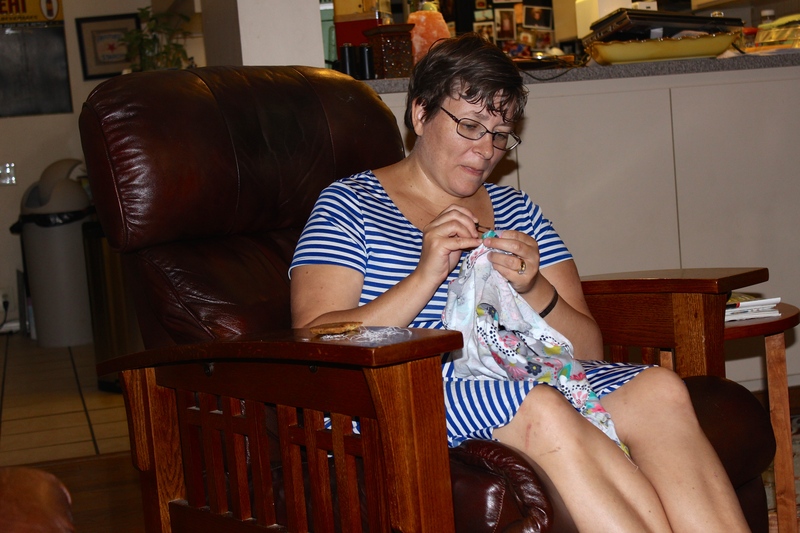 Trish brought along her knitting, and got some pointers from friendly and helpful people there. I got my drop-spin lesson from the excellent Jane Dominguez. Why are we wearing hats, you wonder? Oh, the theme of the Fiber In this year was England, and they asked us to wear hats. Plus, it was a game day; the gators were playing Tennessee in Gainesville. Although a few people complimented my gator hat, Tina said she might have heard a few dissenting murmurs as I and my hat passed by. 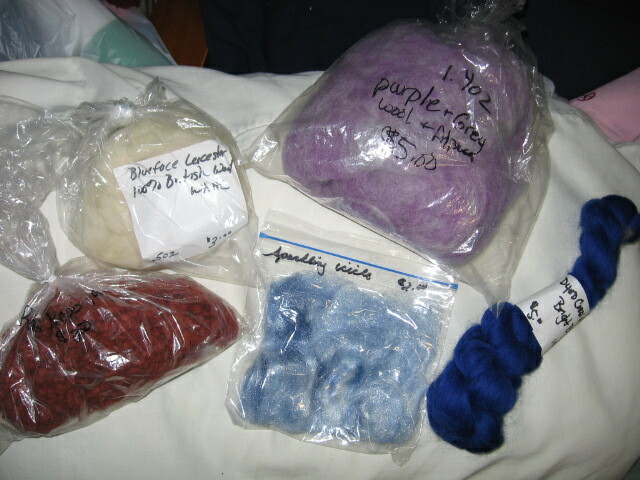 I found another yarn store in Winter Haven I didn’t know about, called Four Purls. 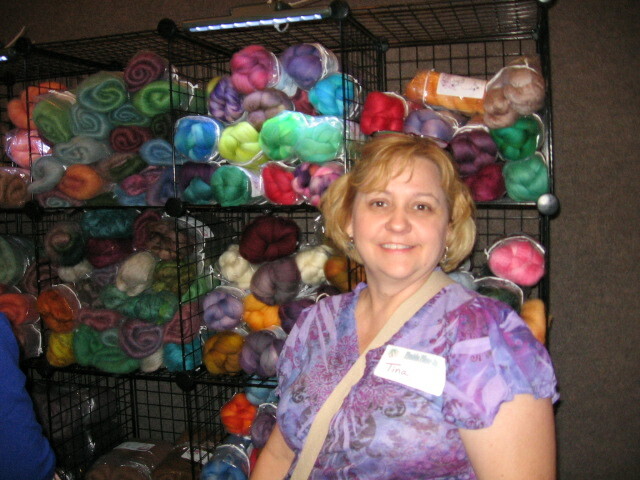 They had a fabulous booth at the Fiber In. 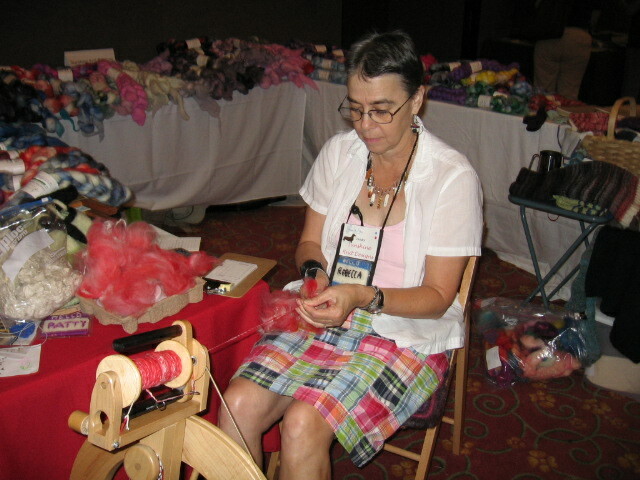 We watched Rebecca Bowen, from St. Augustine, spin on her wheel, and I bought a couple of hanks of luscious Long Dog handspun roving from her booth Sunshine Knit Designs. 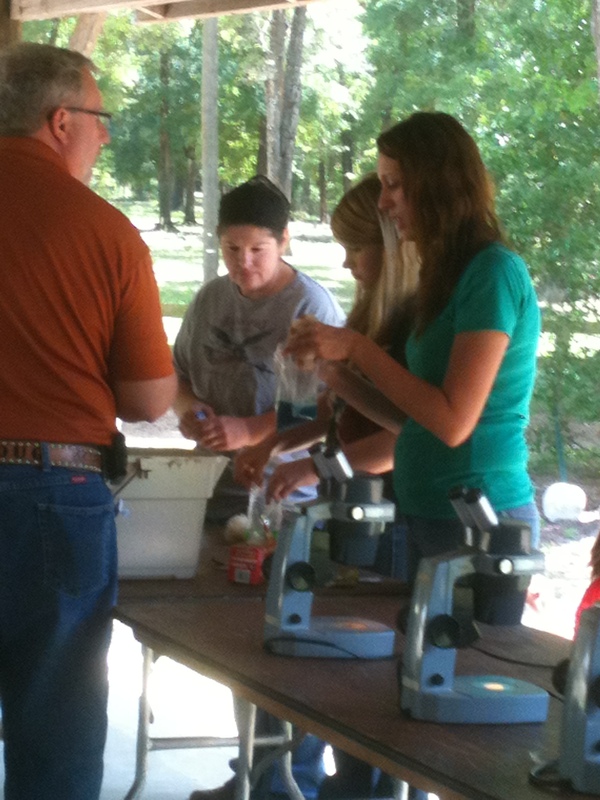 Bowen was one of the presenters of the Continental vs English workshop that Ethel and her friend Dale attended. 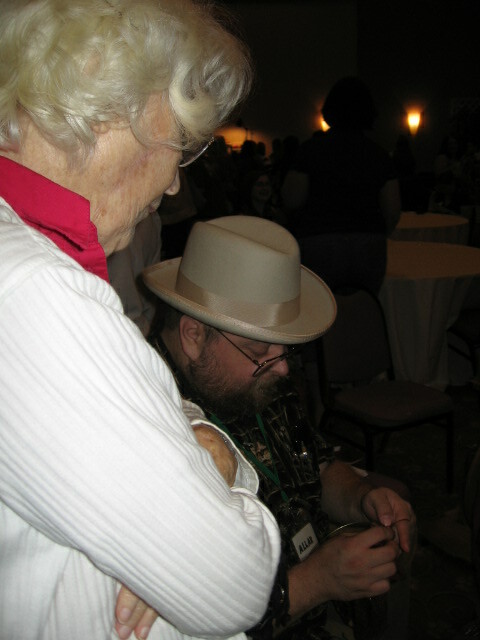 Ethel met Dale on the Knitting Paradise online forum, and talked her into coming from east central FL to the Orlando conference. 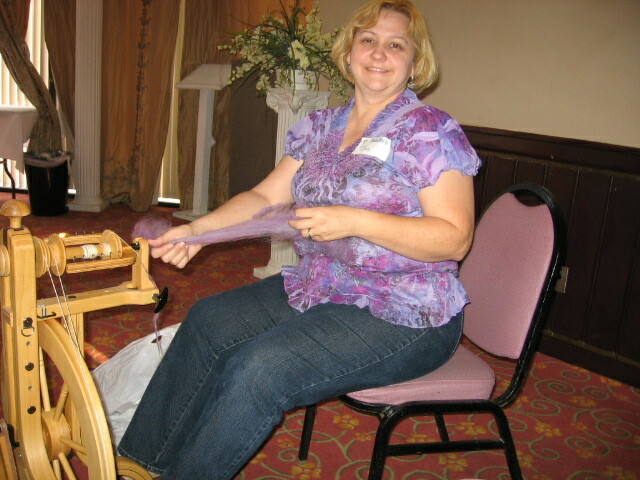 Tina also mentioned the Fiber In to a co-worker Chelsea, and we were delighted to see her there at the seminar, too. 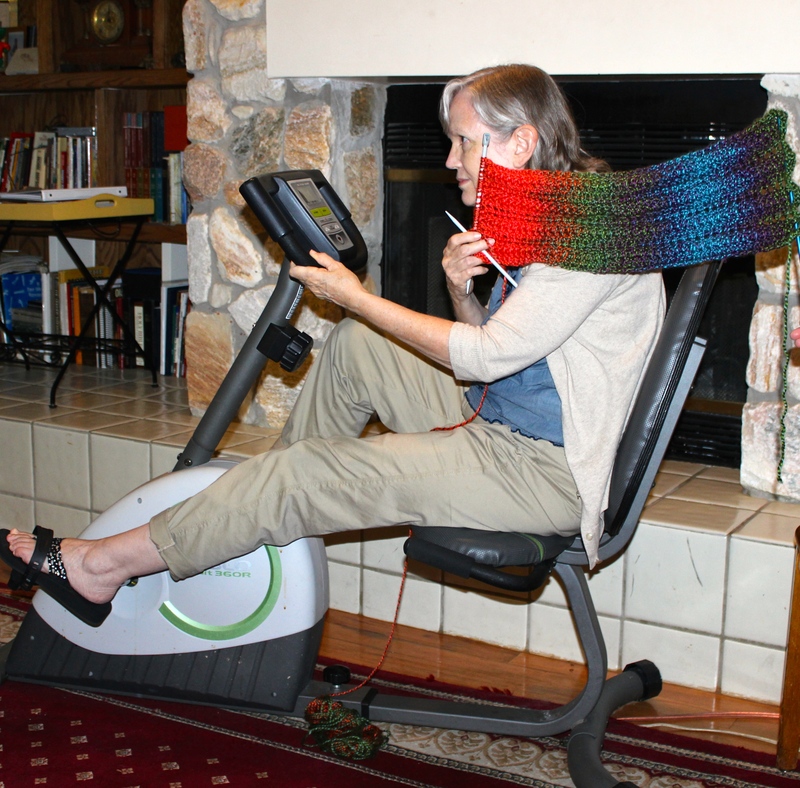 Maybe she will come and join us at Wednesday Night Knitting as well. 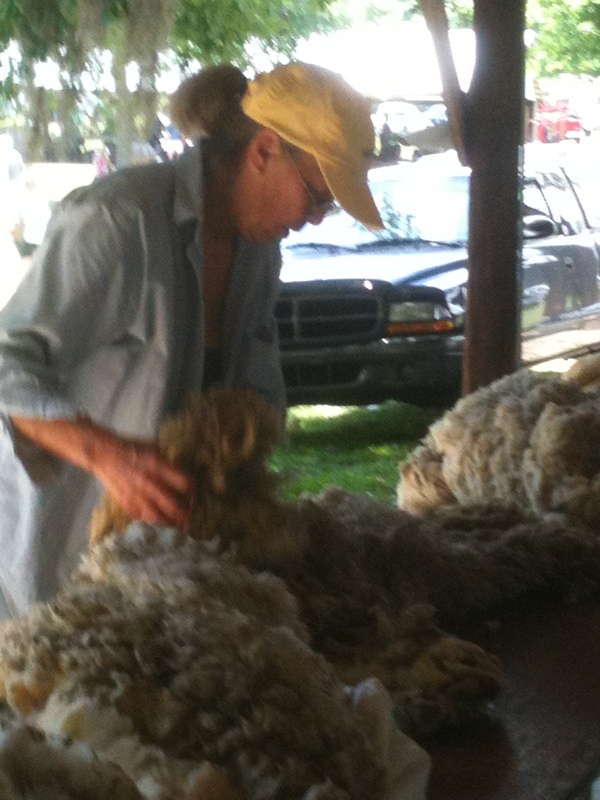 One of my best experiences was hanging out at the Funny Face Farms booth, watching Billie card wool, and learning the names of some of the loose fibers from Brennan. 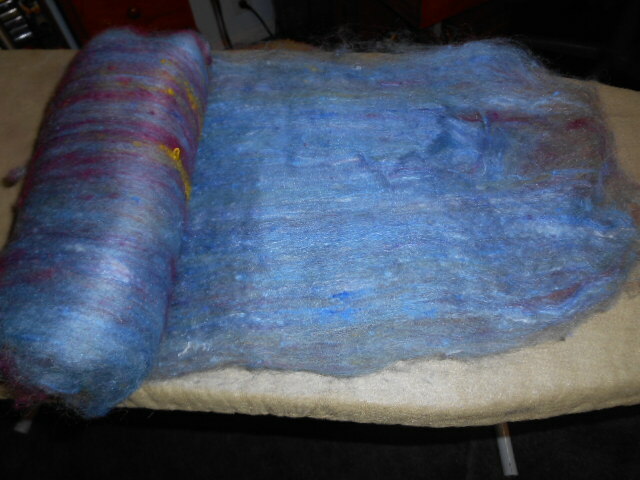 In the Fibers pic, the green and blue at the top are from Romney sheep. 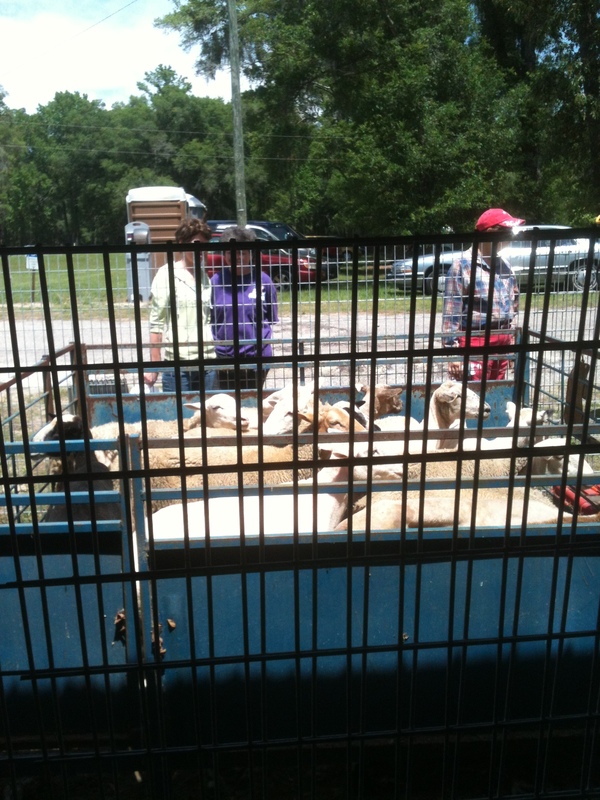 The light gray fiber at the upper left is locally grown (they are in Brandon, FL) Angora. 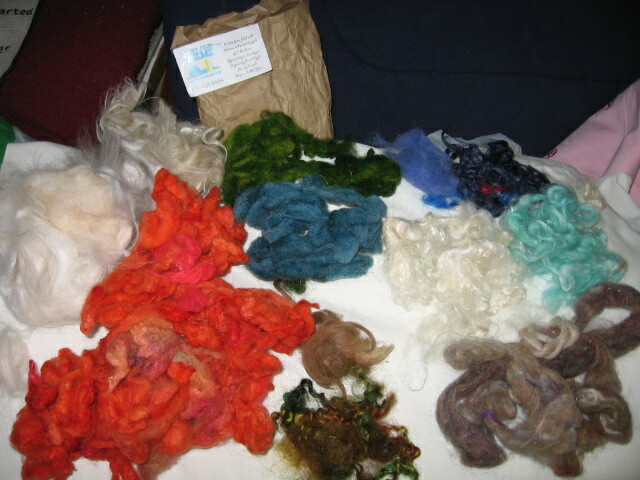 The seafoam green fibers at the right are from Shetland sheep. 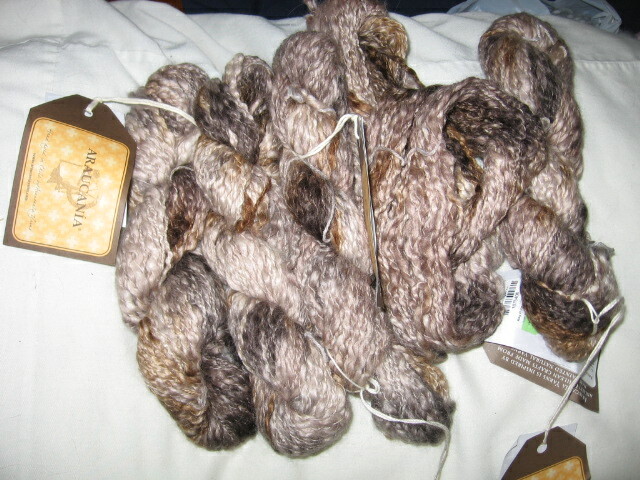 The taupe and brown fibers in the lower right are alpaca. 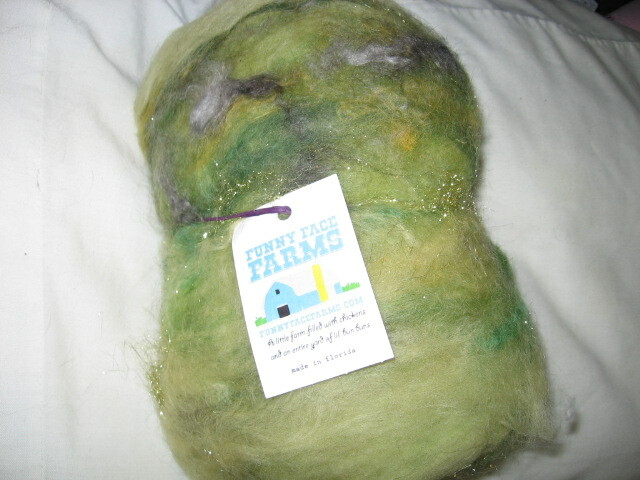 The curly green and orange ones at the bottom are from Wensleydale sheep. 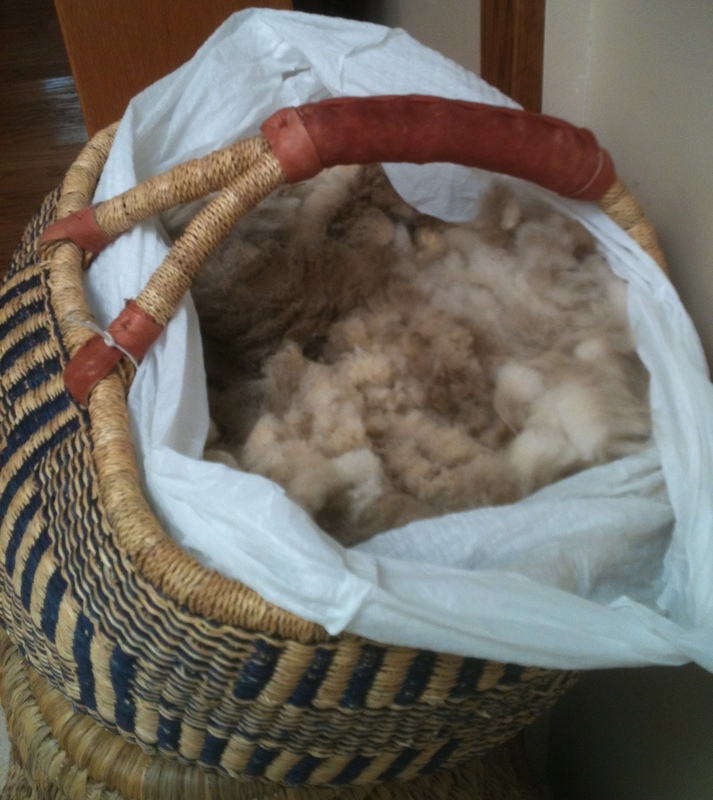 A Fuzzy Farm had the booth in the back of the room, with the plastic drop spindles, weaving looms, silk scarves and hankies to be felted as Make and Take projects, and many treasures in the form of kits and raw and carded pouches of fibers of all descriptions. Proprietor Lorie McCombie warned that her kids are in charge of her web site and don’t always have it up to speed. 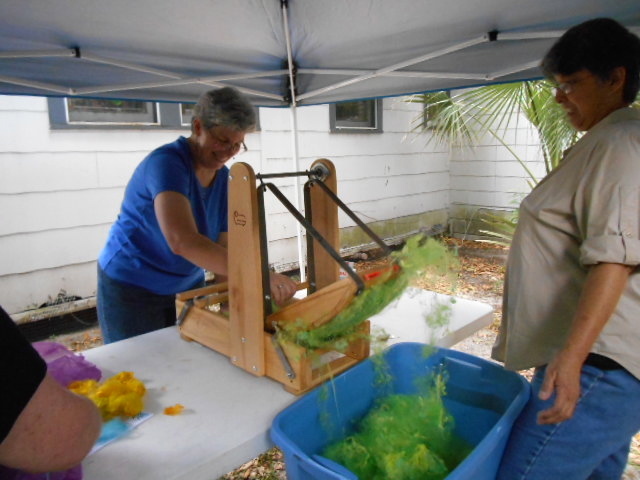 Ethel and her friend went to the Japanese Short Rows workshop, and we left soon after that one, missing the last two scheduled demo’s by Ginger from Ewephoric Fibers in Gainesville. 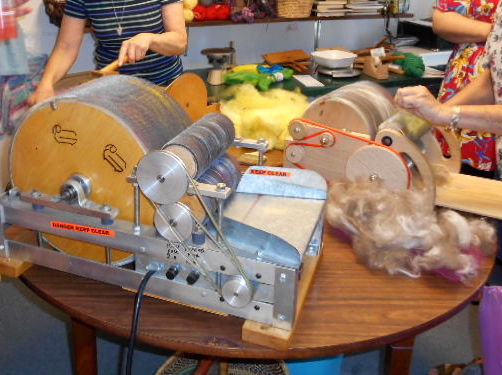 Lois and Ethel did spend some time at the spinning wheel with Jane’s husband Allan. 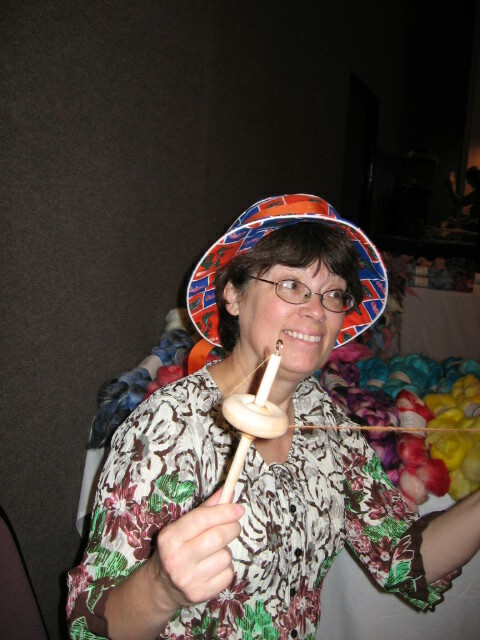 Tina learned to spin on a wheel, and made herself a little ball of yarn. We found spinners to be very friendly, straightforward people! 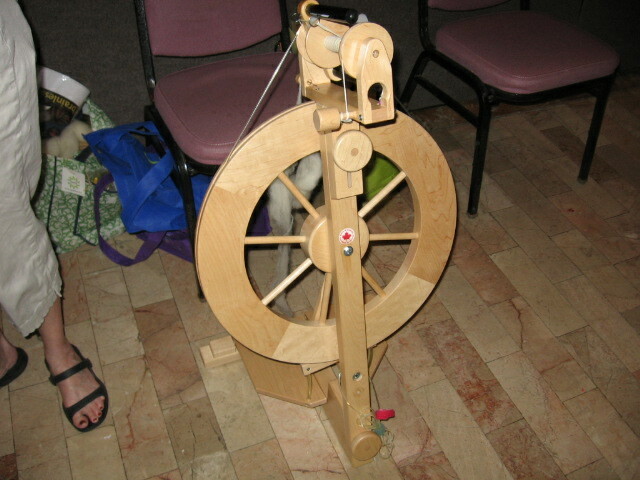 I heard that the Ewephoric Fibers folks in Gainesville teach intensive spinning classes, and will loan out wheels, with a deposit of course, to those who take the classes that come with a guarantee: you WILL learn to spin! Tina and the wheel--beginning of a beautiful friendship? 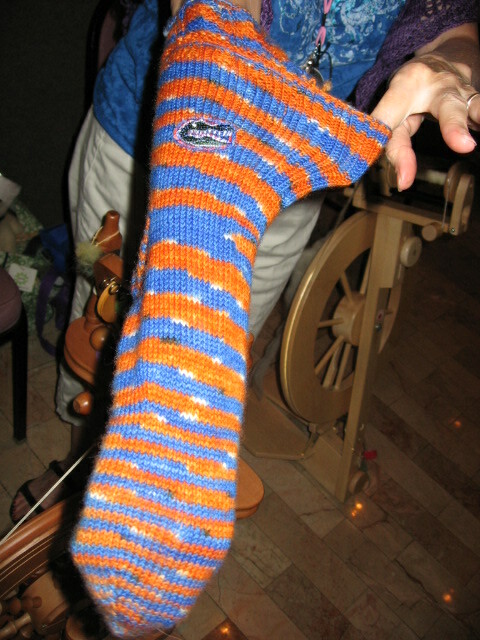 close up of gator sock, see the little pocket just above the gator head? 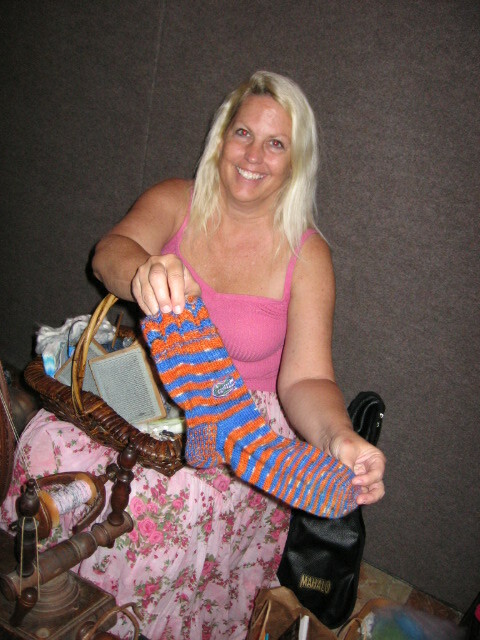 The gator sock lady had a Lendrum wheel, which she bought about 10 years ago, with attachments she sometimes never uses, for about $600. She said she was told that the Lendrum is the best choice for Florida because it is solid maple, and does well with Florida’s humidity. 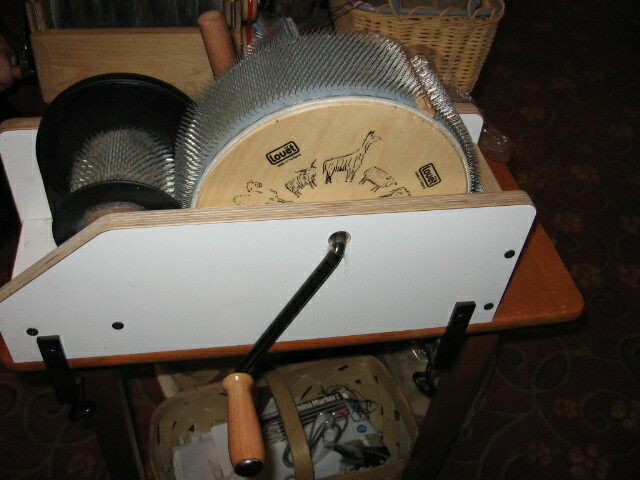 She said the Kromski wheel, another good brand, is made of a composite wood. 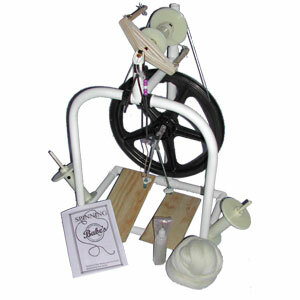 She said if you’re thinking of buying a wheel and you see one advertised somewhere, GET IT because once the workshops and seminars start this time of year, they all sell out fast, and there are only a few spinning wheel makers around. I found some good info about wheels on The Woolery site. 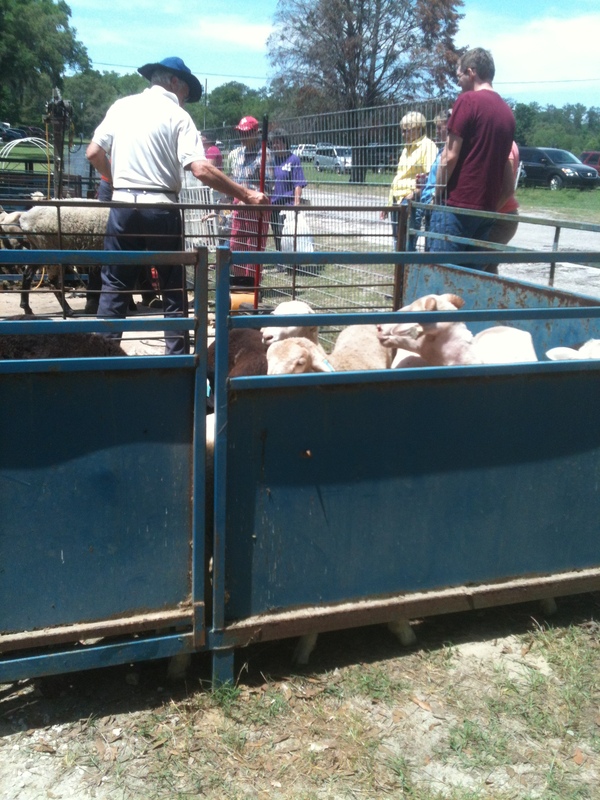 We saw wheels of all kinds, shapes, sizes and ages. 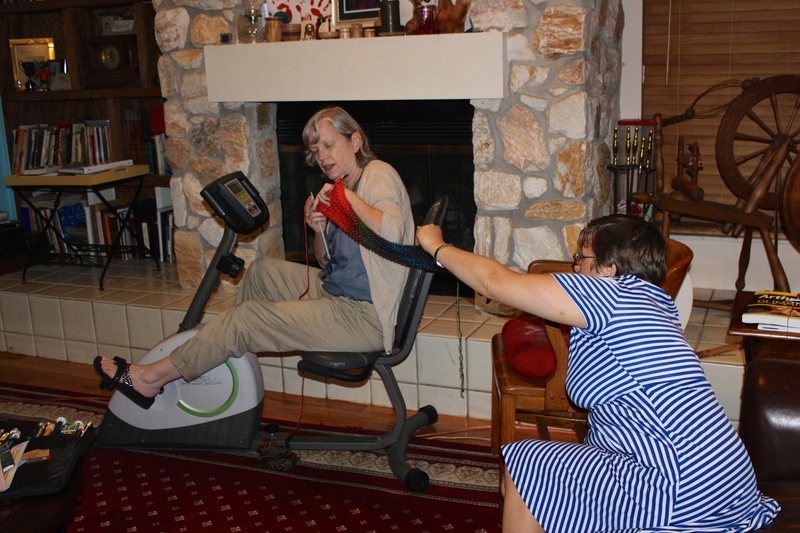 Someone said you can find patterns online to make a spinning wheel from a bicycle tire.